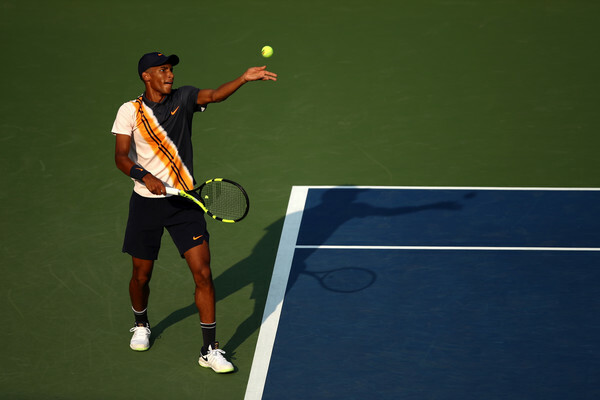 In an all-Canadian teenage battle on Day 1 of the 2018 U.S. Open, Félix Auger-Aliassime was forced to retire due to health concerns relating to an elevated heart rate against good friend Denis Shapovalov. In the youngest Grand Slam matchup in almost eight years, 18-year-old Canadian qualifier Félix Auger-Aliassime was forced to retire midway through the third set against 19-year-old compatriot and number 28 seed Denis Shapovalov, putting a heartbreaking end to his U.S. Open main-draw début. Shapovalov was leading 7-5, 5-7, 4-1 when Auger-Aliassime was forced to retire, citing health concerns relating to an irregular heartbeat that the 18-year-old admitted to struggling with in the past. 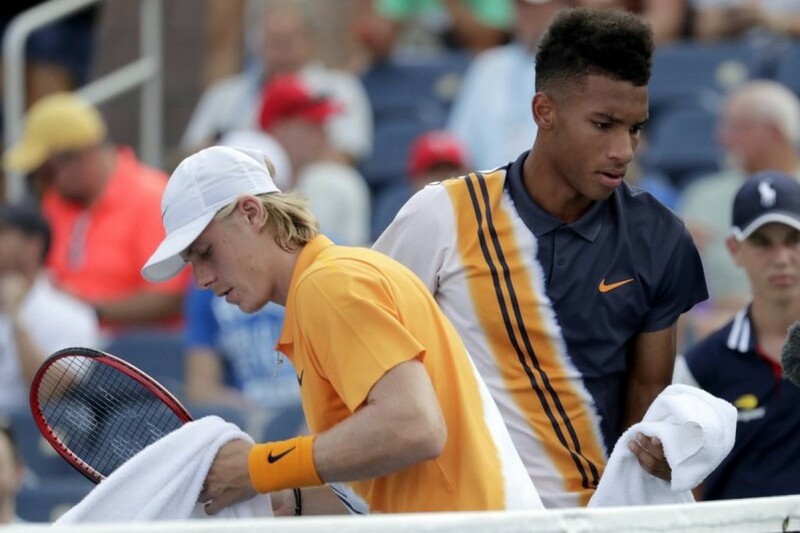 Having grown up together contesting some of the biggest junior titles in the world, Shapovalov and Auger-Aliassime are certainly no strangers to each other’s games. In addition to being occasional doubles partners, with the highlight undoubtedly being a run to the 2015 U.S. Open boys’ doubles title as a team, the two are among the leaders of a young crop of talent that represent the future of men’s tennis in Canada. 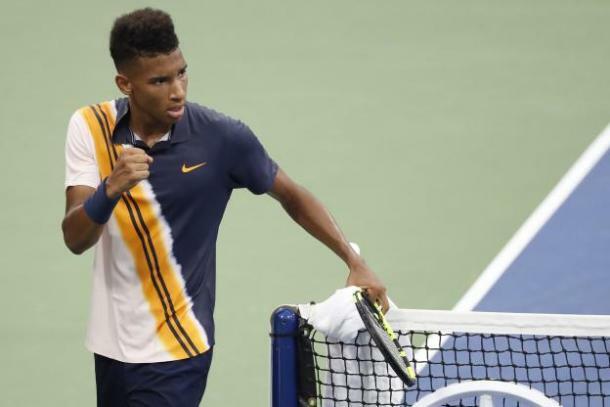 As a result, when it was announced last Friday that Auger-Aliassime had been drawn to face none other than his old childhood friend in his main-draw début at Flushing Meadows, the tennis world was taken by storm by the possibility of another rivalry in the making between two of the ATP’s NextGen stars—and the first two sets certainly lived up to that hype. With three wins in qualifying already under his belt, it was Auger-Aliassime who would get off to the better start, trading breaks early with the 28th seed before eventually consolidating to take a commanding 5-2 lead. Using loopy groundstrokes to Shapovalov’s one-handed backhand to put him on the defensive before stepping in to take control of the big points, one wouldn’t be able to tell that it was Auger-Aliassime who was the more inexperienced of the two when it came to competing at the highest level. 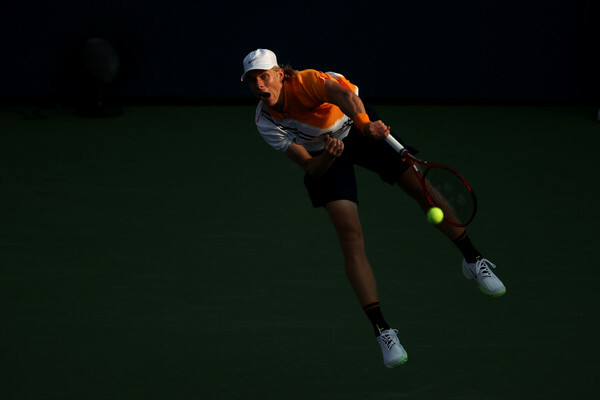 However, as the set slowly progressed from there, it was Shapovalov, who made the fourth round in his début at Flushing Meadows last year, who was able to use some of that extra experience to turn the set around on a dime. As the 19-year-old began to play more high-percentage tennis, it was now Auger-Aliassime who was the one who began to make the errors, allowing Shapovalov to easily recover the early break when the 18-year-old served for the set at 5-3. With his newfound lifeline, Shapovalov was finally able to find his groove, reeling off the next few games to complete the comeback and steal the opening set from Auger-Aliassime, 7-5, in 53 minutes. 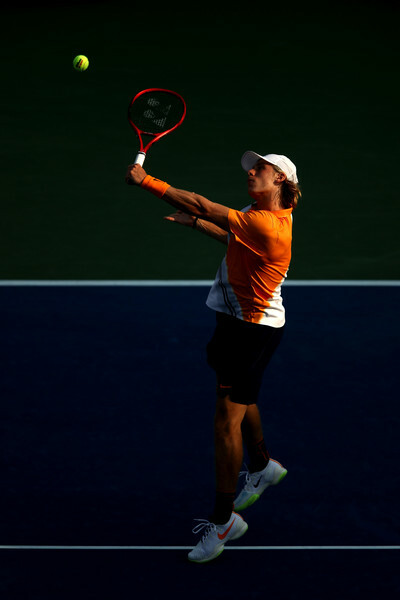 Having unexpectedly reeled off five games in a row to take the opening set, Shapovalov carried this newfound momentum into the early stages of the second, managing to neutralize Auger-Aliassime’s aggressive patterns of play and finding ways to keep him on the defensive. After trading holds to start the second, Shapovalov would take advantage of a few uncharacteristic errors from Auger-Aliassime in the third game, including a double fault on break point, to go a set and a break to the good. However, it was at this point where things curiously began to go south for Shapovalov, and it was Auger-Aliassime who would take full advantage. After the 28th seed also double-faulted to hand back one of the breaks on a silver platter, the 18-year-old from Montréal began to play with a spring in his step, doing a better job of not only targeting Shapovalov’s one-handed backhand but also getting more first serves in—two of the keys that allowed him to take control early in the match. While Shapovalov managed to temporarily right the ship in the eighth game to move one step closer to a two-sets-to-none lead, Auger-Aliassime didn’t panic, doing what he could on his own serve to make his countryman serve for the set. And when push came to shove, it was indeed the younger and more inexperienced of the two that began to look more at home on the Grandstand. Taking advantage of a few loose errors from Shapovalov, Auger-Aliassime would recover the remaining break, saving a set point in the process, and earn a crucial hold to move within a game of drawing level at a-set-apiece. In the decisive twelfth game, both players had their fair share of chances, with Auger-Aliassime seeing three set points come and go and Shapovalov, a chance to force a second-set tiebreak. With the score tied at deuce, the end of the second set took a dramatic twist, with Auger-Aliassime managing to correctly overturn a call by less than a millimetre to set up his fourth set point. On said set point, Shapovalov hit a shot long after managing to rip his shirt, but challenged the call in a last-ditch effort to save the set. Remarkably, it worked. With the one-millimetre call managing to go his way this time around, he quickly changed his shirt and walked back with two new racquets to replay the point. However, that proved to be all in vain as he would make another backhand unforced error to hand Auger-Aliassime the set by the same margin as the first, 7-5. 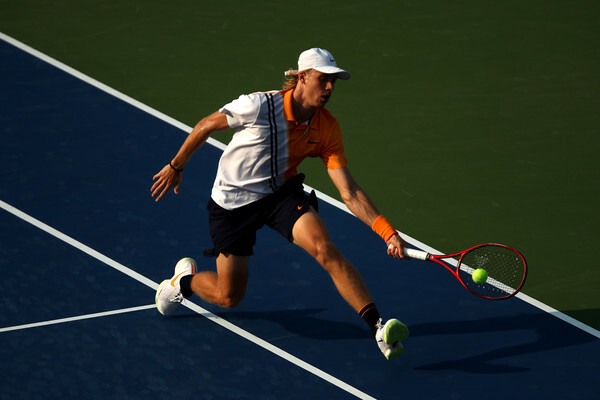 With the excitement building on Grandstand after two high-quality sets of tennis, it was Shapovalov who would rebound from the disappointment of letting the second set slip through his fingers by hitting the ground running with an immediate break—one that he would immediately consolidate to take an early 2-0 lead. As the points began to grow more physical, Auger-Aliassime seemed to look increasingly weary, especially after being broken. Once Shapovalov consolidated the break, the 18-year-old requested to see the doctor, who came onto court and tried to help Auger-Aliassime slow down his heart rate, doing everything from getting him to lie down with his feet up to drenching him in bottled water to prevent him from overheating. After a six-minute break, the Canadian qualifier returned to court and remarkably held serve, but still looked concerned, choosing to lie down on changeovers rather than sit down. Meanwhile, Shapovalov, who was understandably concerned for his close friend, still had to keep playing on his terms, holding at love to maintain his early break. From there, he would break Auger-Aliassime one last time before the 18-year-old decided to call it a night, retiring due to an elevated heart rate. In one of the most touching sporting moments you will see in a long time, Auger-Aliassime went to shake hands with Shapovalov but the two ended up falling into an emotional embrace—and rightfully so. As Auger-Aliassime began to break down in tears, Shapovalov was right there to comfort him in not only sportsmanship but also friendship, giving him words of encouragement after what had been a very spirited two-and-a-half hour battle. “I told him at the net we’re going to play a lot more times, we’re going to be back here playing in the finals one day, so I told him to keep his head up. He’s had such a great run, and it was a great match today,” Shapovalov said in his post-match interview with Canadian sports broadcaster TSN. After talking to the doctor, Auger-Aliassime spoke with the media to explain exactly why he was forced him to retire from Monday’s match. “I think we had first two good sets, and then after the second set, I started feeling some fast heart rates, palpitations—something I’ve experienced before,” he recounted to TSN. 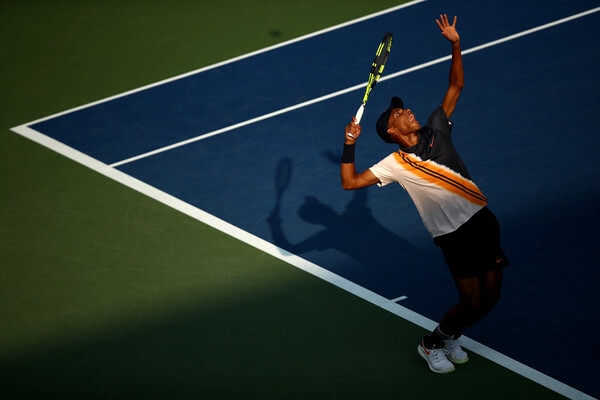 According to reports, Auger-Aliassime has tachycardia, a disorder in which the heart beats faster than normal while at rest that it can’t fill with blood before it contracts. According to him, this is a disorder that has caused him to retire or withdraw from matches in the past, but this is the first time it has clearly affected him at this level.